The Sentinel GS reticle has a brightness control option and a range-finding scale to facilitate adjustment when shooting at different distances (provided the shooter knows the size of the target). Initially, the riflescope should be sighted at a known range (say 50m) on the central cross-hair. Distance is determined by placing a target with known width (specific value depends on riflescope’s model) between the marks of the ranging chevrons “>..<”. If the target fits between the marks, you should make the vertical adjustment according to the mark. The reticle colour can be switched at any time from green-on-green to red-on-green to optimize performance depending on the contrast of the target/surrounding vegetation. The optical system employs an internal focusing mechanism (from 5m to infinity) with 'definite' click-stop focus positions. The focusing provides clear images at extremely short distances as well as optimising quality at all distances within the riflescope's working range. 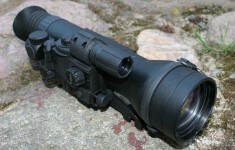 A Weaver 7/8" rail on the left side of the body designed for mounting additional accessories (IR flashlight, DSAS, red dot laser). The stabilized voltage of the power supply prevents reticle shift and drop in reticle brightness and guarantees the tube's and IR-illuminator's proper operation, even when the batteries are nearly empty. The batteries are positioned vertically, which enhances reliability of energy supply when recoiling. The 3 button remote control (two duplicate the "On/Off" function) is helpful for tactical applications and can be mounted on any easy to reach part of the weapon. The third button is intended for an Instant On start-up of the riflescope.